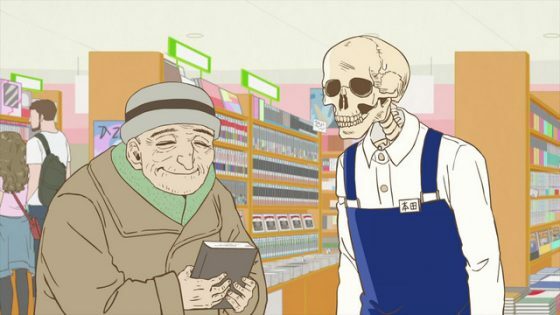 With its colorful cast of strange-faced bookstore employees and equally amusing customers, Gaikotsu Shotenin Honda-san’s wacky workplace comedy has been a fun addition to this season of anime. For those looking for more, here are our picks for anime we think you’ll enjoy! We’re making our recommendations based on their similarity with Gaikotsu Shotenin Honda-san’s style of humor, workplace setting, and insight into Japanese culture. Check these out! 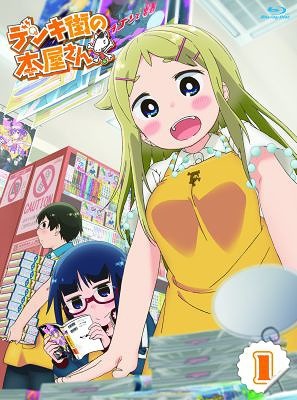 Denki-gai no Honya-san is our most obvious recommendation because it is similarly a comedy series about the employees of a bookstore and even has a somewhat similar name. 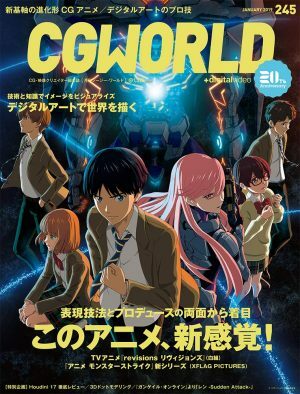 The story follows Umio, the newest hire at Uma no Hone comic shop, and the rest of the employees going about their comedic daily lives. Each of them has their own quirks, talents, and nicknames for each other. There’s Sensei, a nervous girl who is also a doujin manga author; Kameko or “Camera” who is always snapping photos but is deathly afraid of having her own picture taken; Hio-tan, who’s extremely clumsy and a huge BL fan; Fu Girl, a high-schooler who’s obsessed with zombies, and others! Denki-gai is full of nerdy references and has a sometimes raunchy style of humor similar to Honda-san’s and even more otaku-related since it’s a manga shop instead of a general bookstore. While it might not have as an overtly weird cast as Honda-san, its character interactions are a lot of fun to watch at least visually, as they play off of each other and make everyday interactions entertaining. If that sounds good, watch it! 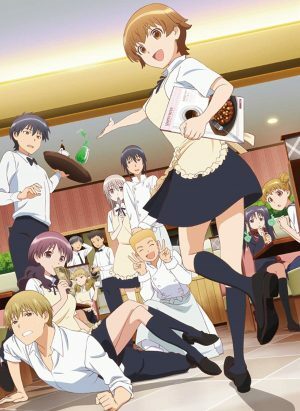 Souta Takanashi is a 16-year-old high school student obsessed with small and cute things who gets recruited to join the staff of Wagnaria Family Restaurant by the small and cute Popura Taneshima (who is actually a year older than him despite her size). At his new job, Souta has to deal with the violently androphobic Mahiru Inami, katana-wielding Yachiyo Todoroki, apathetic manager Kyouko Shirafuji, and more colorful characters, not to mention the customers! Working!! 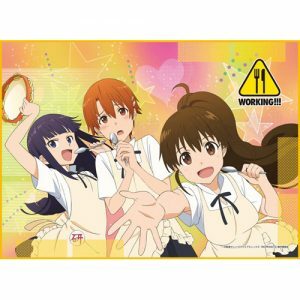 is a slice of life comedy centering around an eccentric cast of characters in the fast-paced environment of a restaurant. Like Denki-gai there is also a romance aspect that becomes more important to the story as time goes on but it is still very much a comedy at heart. If you’re looking for another workplace comedy, especially if you are interested or have experience in restaurants, Working!! is definitely one worth checking out. 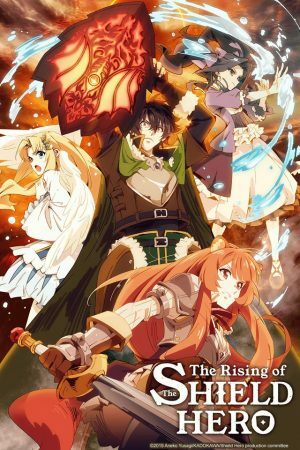 It also has fantastic music and received multiple sequels and a spinoff anime to enjoy if you like the main series. 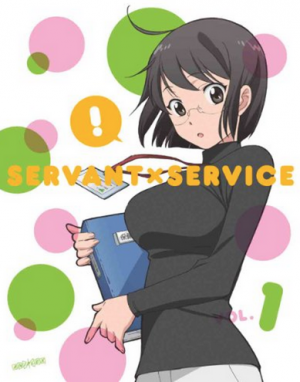 Servant x Service is basically Working!! 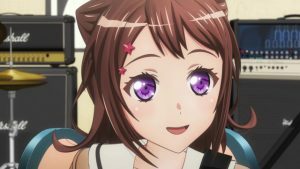 but set in a government office instead of a restaurant, it even shares the same original manga author and production studio, so if you like Working!! you will probably like Servant x Service as well and vice versa. The story follows “Lucy” Yamagami, a young woman who became a civil servant for the local government primarily to find and get revenge on the bureaucrat who approved her first name (which is obnoxiously long so she goes by Lucy). 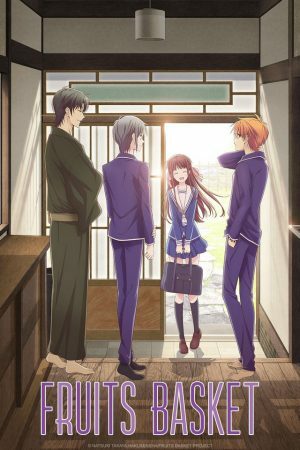 Lucy works with flirtatious slacker Yutaka Hasebe, a third-generation city employee often getting the email addresses of pretty clients, the soft-spoken Saya Miyoshi, aloof anime otaku Megumi Chihaya, and others in this wacky sitcom with a bit of light romance. The show is overall a little more mature than Working!! but is still full of lots of laughs. Some special touches like the absurdly long episode titles (referencing Lucy’s name situation) add to its charm. 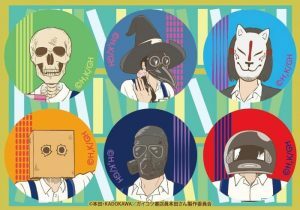 Like Gaikotsu Shotenin Honda-san, it offers some insight into employment in Japan, albeit a pretty light-hearted one, and has some fun with the clients who come into the office. Check it out! 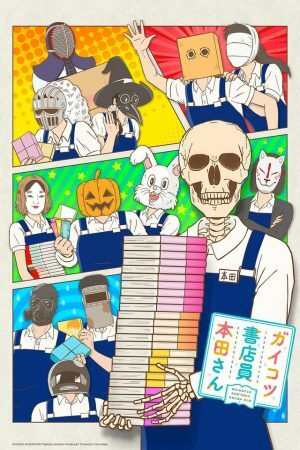 Any Anime Like Skull-face Bookseller Honda-san / Any Anime Like Gaikotsu Shotenin Honda-san ? Kokonotsu Shikada, nicknamed "Coconuts", is the heir to his family’s dagashi shop, an old-style Japanese store specializing in cheap snacks, toys, and candy for children. 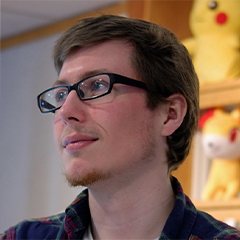 However, he isn’t excited at all about running the store and instead wants to become a mangaka. 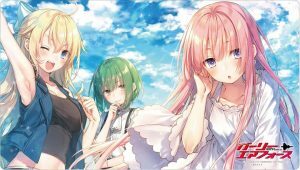 Things start getting interesting for Coconuts after a strange girl named Hotaru Shidare arrives in town who is completely obsessed with all kinds of dagashi. She is in search of Coconuts’ father, You Shikada, who she is trying to recruit into her family’s giant candy manufacturing company. While You initially refuses, they later make a bargain that he will join if Hotaru can convince Coconuts to run the store. 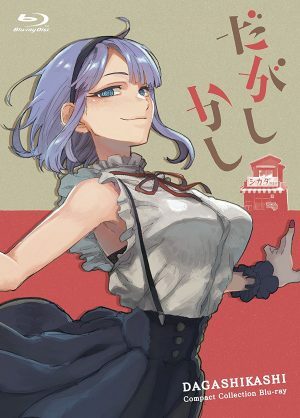 While it might sound like Dagashi Kashi has a little bit more of a plot than our other picks so far, it mostly comes down to Hotaru challenging Coconuts to a variety of dagashi-based duels in order to try and convince him to stay at the store. They are also often joined by Saya Endou and her twin brother Tou, who are friends with Coconuts and run a cafe nearby. While the tone and comedy are a bit different in Dagashi Kashi, we think Honda-san fans will enjoy all of the cultural tidbits relating to dagashi which the show revolves around, providing you like snacks of course! The character design and music are also excellent! The world of Shirokuma Cafe is very much like our own but animals and humans are more or less on equal footing, able to talk and work together. Shirokuma is a polar bear that runs his own cafe which is visited by a variety of animals and humans alike. Some of Shirokuma’s regulars include Panda, an immature and lazy but loveable teenager who works at the zoo, and Penguin, a tsukkomi-type character who is something of a straight man to Panda and Shirokuma’s antics, has an unrequited crush on another penguin, and works at a bakery. 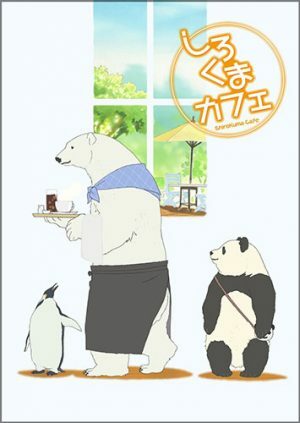 Shirokuma Cafe is a comedic slice of life series about the daily happenings at the titular cafe between the various customers that visit. It has lots of fun character interactions and little musings on human and animal behaviors. Unlike a lot of other series, the animals are all drawn in a realistic style that adds to its slightly surreal charm. The series also features really great voice acting along with some cute in-universe songs from the cast that really add to the experience. Compared to Honda-san, it’s much more relaxing and less otaku, but a show we highly recommend nevertheless for its broad appeal and simple charm. If Shirokuma is a chill alternative to Honda-san, Inferno Cop is the exact opposite. This explosive web series from Trigger is simply non-stop insanity from start to finish. In Jack Knife Edge Town, the flaming skull-headed Inferno Cop dispenses ruthless justice, fighting crime, corruption, and a mysterious organization known as Southern Cross in an ever-escalating series of absurd events that parody a lot of western media cliches, specifically 80’s style action movies. Inferno Cop is a ridiculous satire of many clichés that really is best left unexplained and experienced firsthand. Besides its skeletal protagonist, Inferno Cop also ostensibly tells a workplace story but really shares the most with Honda-san in its style of over-the-top, highly referential humor. It also has even shorter episodes than Gaikotsu Shotenin Honda-san, with each one averaging only 3 minutes long, and a similar simple animation and art style (although it’s bad intentionally as a joke in Inferno Cop). 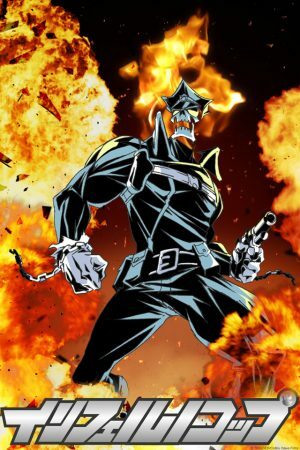 If you’re looking for an incredibly bombastic, crude (in multiple ways), and hilarious anime, definitely check out Inferno Cop! Here you go, 6 cool shows worth checking out for fans of Gaikotsu Shotenin Honda-san! We hope you enjoyed our picks! 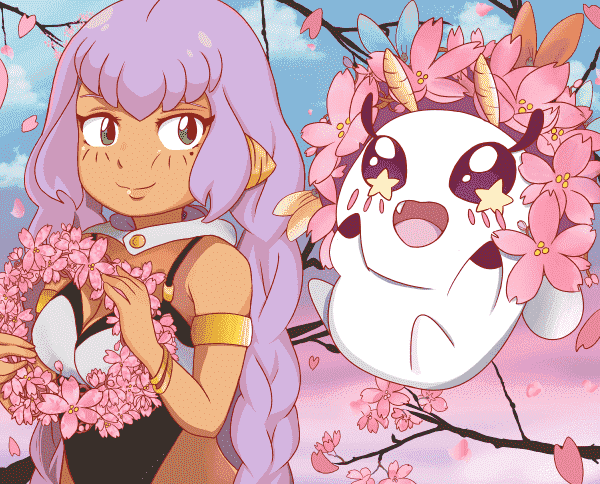 If you have any comments or recommendations of your own, please leave them in the section below and be sure to keep up with all things anime with us here at Honey’s! See ya!